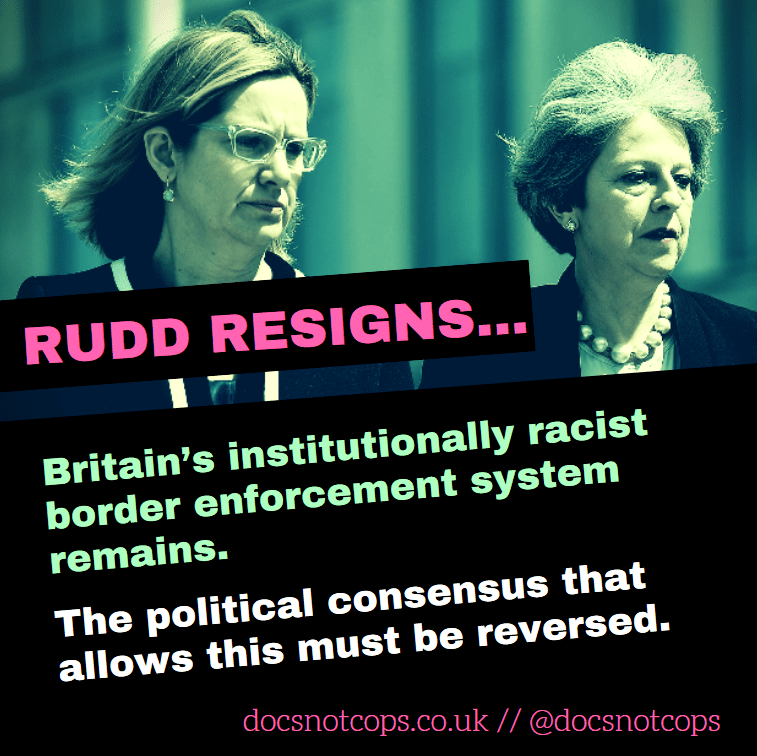 As Amber Rudd has resigned from the position of Home Secretary, Docs Not Cops notes that she resigned over misleading parliament regarding knowing of Home Office targets rather than over the scandalous treatment of British citizens and other people caught up in the immigration removal system. As some of our members are both part of and work directly with communities affected by the detention and deportation regime, and as up to 50 people wait to be forcibly deported via charter flight to Jamaica this week, we are doubtful that her departure signals a significant change to the Hostile Environment policy. Our doubts are founded on the glaring fact that there has been no acknowledgement by this government – nor the opposition – that no-one should be punished with death or debilitating health because of their immigration status. “The UK has committed an atrocious barbarism. It is time for doctors’ leaders to say so – forcefully and uncompromisingly”. That was The Lancet’s response to the deportation of Ama Sumani, a terminally ill cancer patient, to Ghana against the wishes of the Welsh community she lived in. Her deportation and subsequent death happened in 2008 – under a Labour Government. Ten years on it is becoming routine to deny cancer patients treatment: Sylvester Marshall (known as Albert Thompson in media coverage, was denied radiotherapy for six months because he couldn’t prove his immigration status, nor pay upfront – requirements introduced by Jeremy Hunt in October 2017. He will now receive treatment for prostate cancer without having to pay £54,000 – but only after a six month delay, a media scandal, and 420,000 petition signatures. Docs Not Cops was created in response to the introduction of policies that restrict migrants’ access to free healthcare. This undermines a core principle of the NHS: treatment on the basis of need, not financial ability. We know that the imposition of borders within the NHS are only one facet of a complex and ever-expanding system. However, as healthcare workers and anti-racists, we see NHS restrictions as particularly symbolic of the inhumanity of our migration system. This government’s attitude toward working class and particularly racialised migrants is to treat them with suspicion, presumed undocumented and a social parasite on the public purse until proven otherwise. It is this dehumanising culture, rather than particular targets, that has driven the growing presence of ID checks to restrict access to: healthcare; housing; employment; welfare; and even the ability to open a bank account. The Hostile Environment policy seeks to turn every UK citizen into a border guard, to encourage them to racially profile and police their neighbours, patients, students and tenants. These policies have put documentation and the false idol of “secure borders” over the health of sick and vulnerable people, who deteriorate to their death. One woman with precarious immigration status died too frightened to seek treatment for pneumonia. Another man denied treatment at an early stage, died after his lung cancer progressed. Theresa May’s Home Office issued an “end of life plan” to deport Isa Muaza, while he suffered from multiple organ failure. Until the regulations requiring NHS Trusts to check ID are repealed, thousands of people will face upfront bills they cannot pay. Until data-sharing between NHS Digital and the Home Office is dropped, people will fear providing their details. Until the Immigration Health Surcharge introduced in 2014 is abolished, people will struggle to afford visas – people could be deported because of this. The Windrush scandal reveals that determining individuals immigration status is often complex, and that it is regularly onerous for people who are legally resident to prove this. But the scandal also shines a light on Britain’s institutionally racist border enforcement system, showing it to be incredibly violent for anyone ensnared by it. The political consensus that allows this must be reversed, Docs Not Cops will continue to organise and work to build a popular culture where no-one is stigmatised as a drain on public resources but instead Britain acknowledges its wealth was built on the stolen labour and resources of its former colonies and subjects. Xenophobia and racism should be regarded as an abominable relic of history not guide public policy. Many of us affected by this systemic violence are aware of this and fighting to make it a reality. We encourage all who agree to join us into making it a reality. Regardless of status, we believe that no-one should be denied their fundamental right to healthcare. If you want to join us in campaigning to end prohibitive healthcare charges for migrants, the Immigration Health Surcharge on visas, ID checks in hospitals and community care, and for healthcare for all: email docsnotcops AT gmail DOT com. We are particularly keen to hear from health workers, and patients affected by the hostile environment in the NHS.